Easter Ross Combination comprised the 10 parishes of Edderton, Fearn, Kilmuir-Easter, Kincardine, Lochbroom, Logie-Easter, Nigg, Rosskeen, Tain and Tarbat, although Lochbroom later left. The total population of the member parishes in 1881 was 20,220. 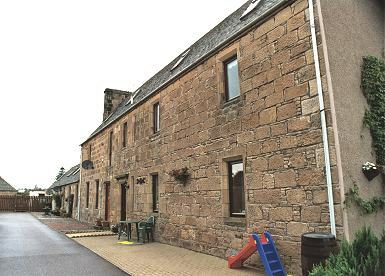 The Easter Ross Combination poorhouse was built in 1849-50 on a site to the south of Tain in the locality now known as Arthurville. It was notable as being the first new poorhouse to be set up in the highlands and islands after the 1845 Scottish Poor Law Act. Much interest was shown in whether it would cut poor relief costs in the way that its proponents claimed. In the first two years of its operation, relief costs did fall, but no more than they were doing across the whole of Scotland over the same period. The front part of the building contained the Master's accommodation an possibly a committee room. 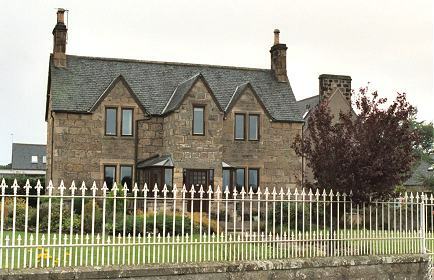 Easter Ross Master's house from the south-east, 2001. At the rear of the building were store-rooms, kitchens, and possibly the dining room. Easter Ross main building from the north-west, 2001. A long narrow building to the right, originally linked to the main building, contained the women's dormitories, workroom and laundry. The men's quarters were in a similar but shorter building to the left. Easter Ross main building from the south-east, 2001. The staple diet in the poorhouse was potatoes, oatmeal and some vegetables. Children and able-bodied had herring twice a week. The full official dietary table is shown below. BREAKFAST AND SUPPER (same) Meal, 3 ounces. Milk or Treacle-water, ½ pint. Same as Sunday. Same as Sunday. Same as Sunday. Same as Sunday. Same as Sunday. Same as Sunday. DINNER Potatoes, 1½lb. Barley-Broth, 1½ pint. Oatcake, 6oz. Pea-Soup, 1½ pint. Potatoes, 1½lb. Milk, ¾ pint. Oatcake, 6oz. Barley Broth, 1½ pint. Oatcake, 6oz. Rice, ¼lb., with ½ pint Milk or Treacle. Potatoes, 1½lb. Milk, ¾ pint. Oatcake, 6oz. Pea-Soup, 1½ pint. BREAKFAST AND SUPPER (same). Meal, 4 ounces. Milk or Treacle-water, ¾ pint. Same as Sunday. Same as Sunday. Same as Sunday. Same as Sunday. Same as Sunday. Same as Sunday. DINNER Potatoes, 2lbs. Barley-Broth, 2 pints. Oatcake, 8oz. Pea-Soup, 2 pints. Potatoes, 2lbs. Herring. Oatcake, 8oz. Barley-Broth, 2 pints. Oatcake, 8oz. Pea-Soup, 2 pints. Potatoes, 2lbs. Herring. Oatcake, 8oz. Pea-Soup, 2 pints. DINNER Potatoes, 1lb. Barley-Broth, 2 pints. Oatcake, 6oz. Pea-Soup, 1½ pints. Potatoes, 1½lbs. Herring. Oatcake, 6oz. Barley-Broth, 1½ pints. Oatcake, 6oz. Rice, 3oz., with ½ pint Milk or Treacle. Potatoes, 1½lbs. Herring. Oatcake, 6oz. Pea-Soup, 1½ pints. Treacle-water ½ pint. Same as Sunday. Same as Sunday. Same as Sunday. Same as Sunday. Same as Sunday. Same as Sunday. An 1852 report remarked with some justification that "...in Easter Ross poor house there is no meat used for any purpose". 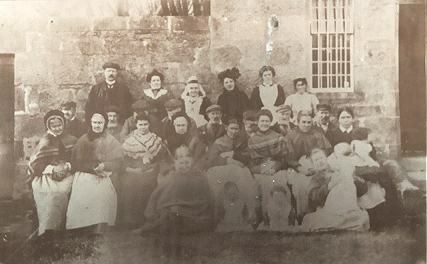 Poorhouse Master and Matron and staff. After 1930, the poorhouse became the Arthurville Poor Law Institution. In 1946 it had 75 beds including 30 for the chronic sick in four ground-floor wards, and two maternity beds. A report at the time noted that 'ceilings are low and windows small'. 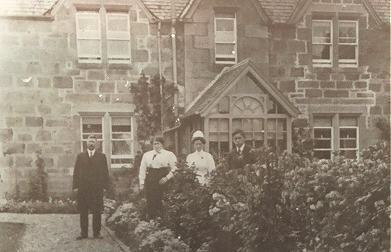 The establishment later became a council-run home for the elderly. The buildings have now been converted to residential use. 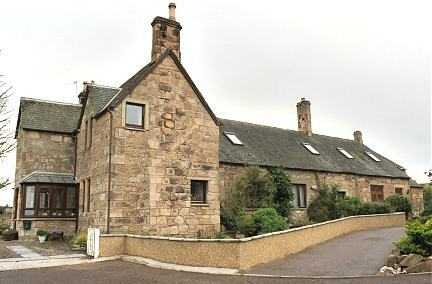 Highland Archive Service, Bught Road, Inverness IV3 5SS, Scotland. Holdings include: Minute books (1930-70); Register of admissions and papers relating to staffing and admissions (1850-1964); Register of poorhouse patients (1938-52).